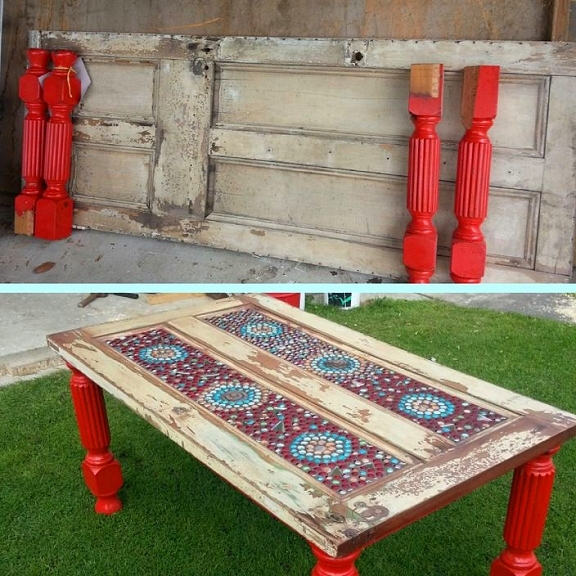 salvaging and repurposing that really excites me! 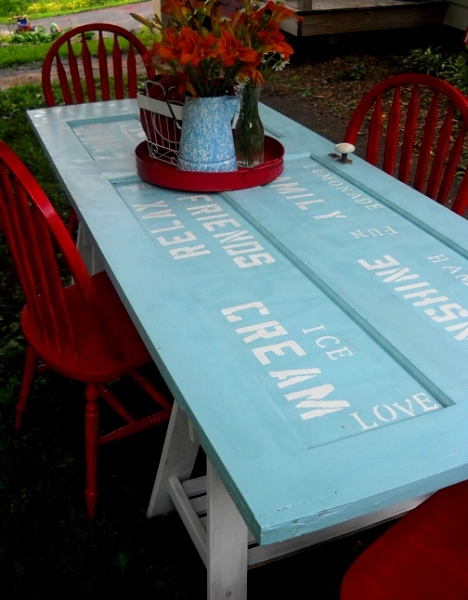 There are so many ways that you can repurpose and reuse an old door inside of (and outside of!) your home. Think creatively. 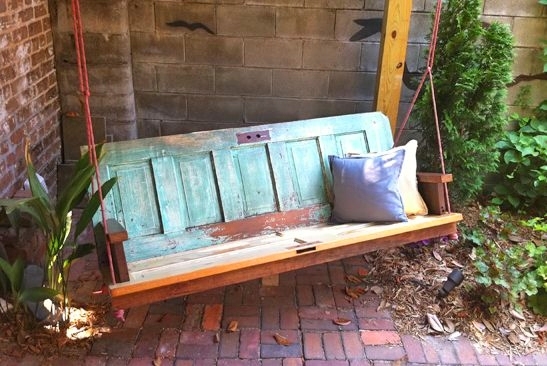 What could you do with an old door? 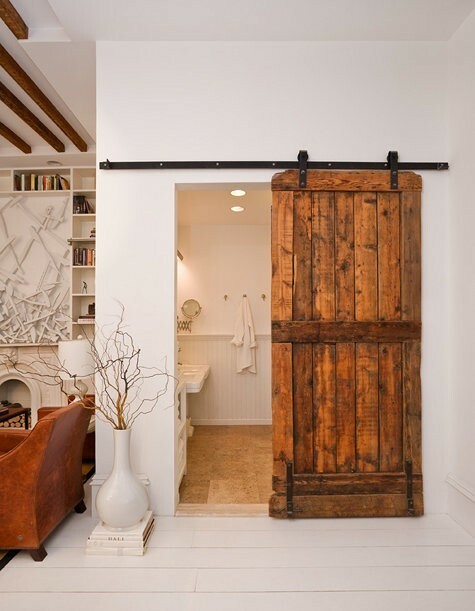 Check out these new takes on old doors and be inspired! 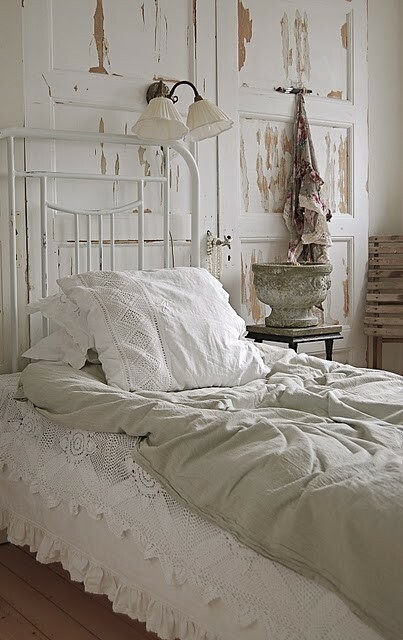 Get this look with decoupage and old wallpaper. 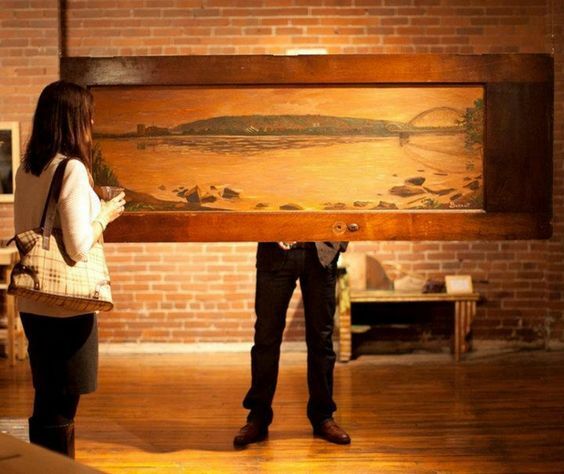 What a beautiful accent piece! I LOVE this look! Simply remove the newer door and replace with an old, salvaged one! 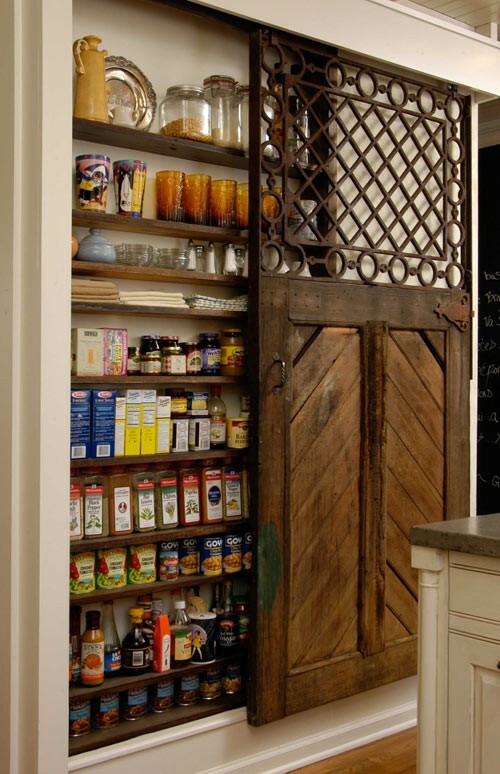 This unique salvaged horse stall door was given new life as a pantry door. Brilliant. 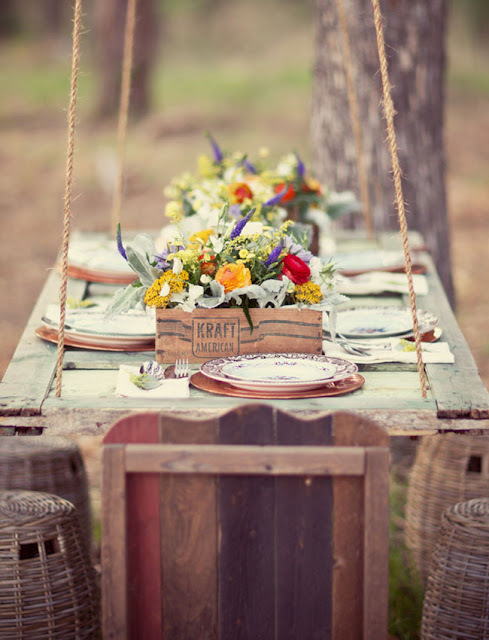 Outdoor bench via Twigdecor. I love the nooks below the bench! Pick up some table legs at your local home improvement store and voila! Love the color. 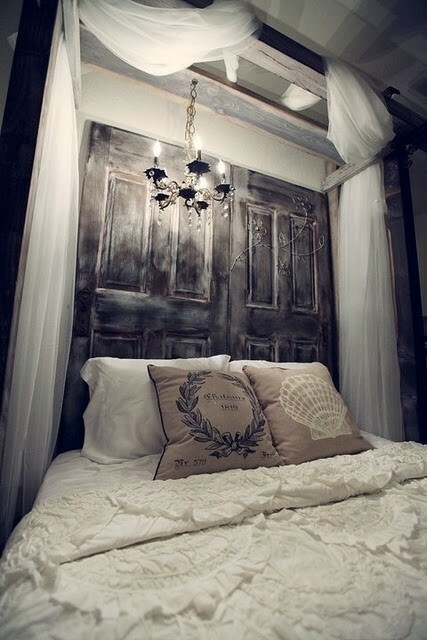 Doors as a dramatic headboard. 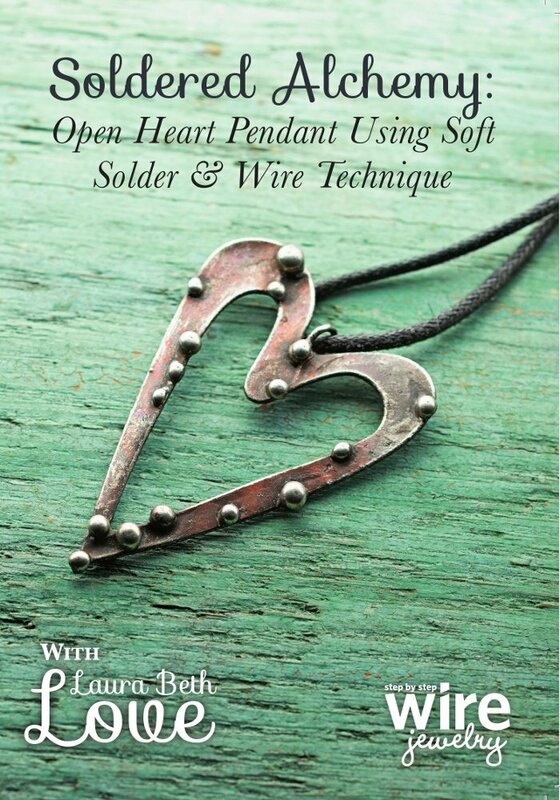 For instructions on how to make your own, check out this article from Martha. Corner shelf from an old door. 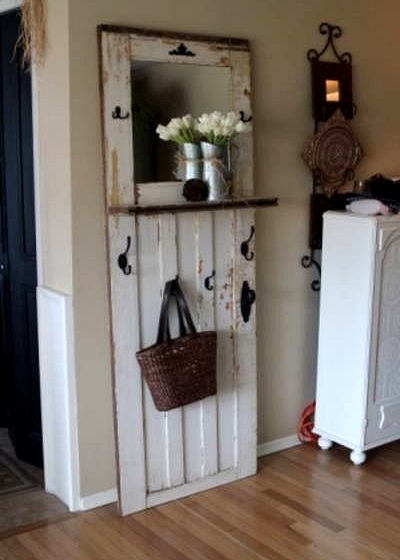 Simply cut the door in half and add hinges or nails, and shelves. Be sure to add a low shelf near the floor to help stabilize and prevent tipping. 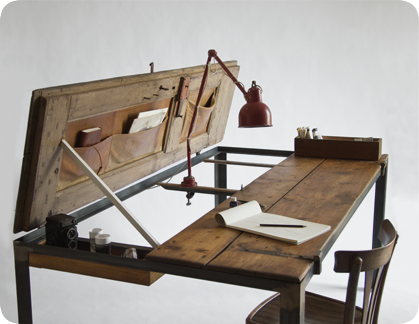 From old door to beautiful catchall. 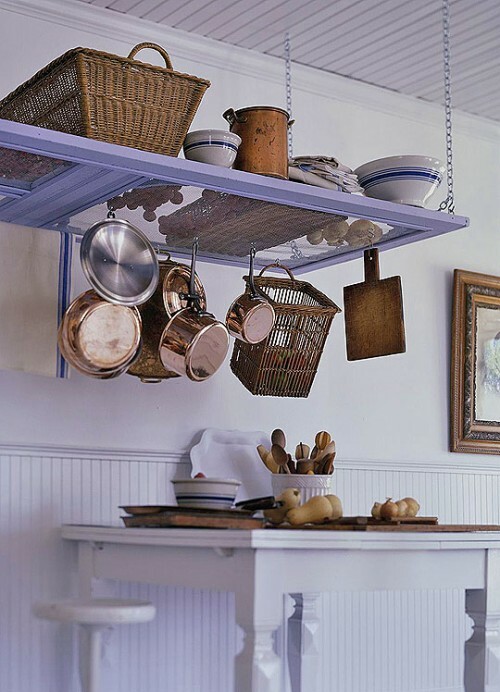 Add some shelves or wire baskets as this one shows. I love the addition of the mirror! WOW! 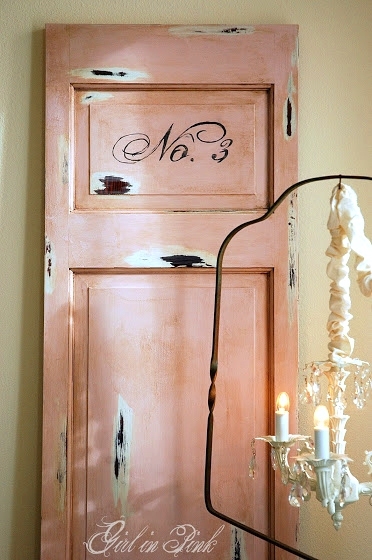 I already have a 'thing' for old doors but now....!!!! I L.O.V.E. 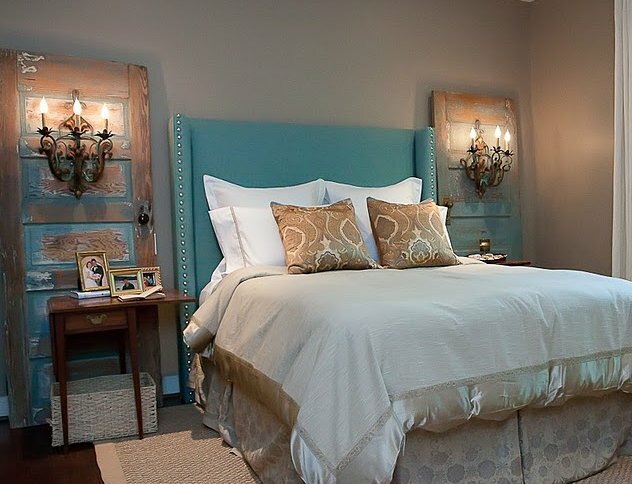 the 2 doors flanking the bed with sconces....brilliant!!! I'll be on the lookout for some to copy that for sure! Thanks for visiting Sherry, glad you liked the post! So many gorgeous picks here! 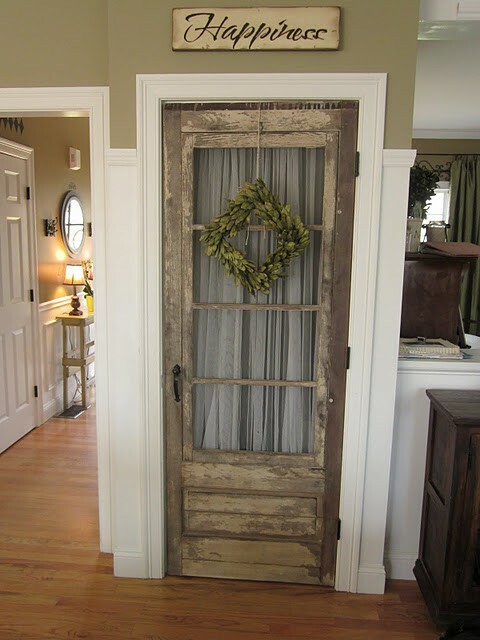 It's amazing how many ways there are to repurpose or salvage old doors. 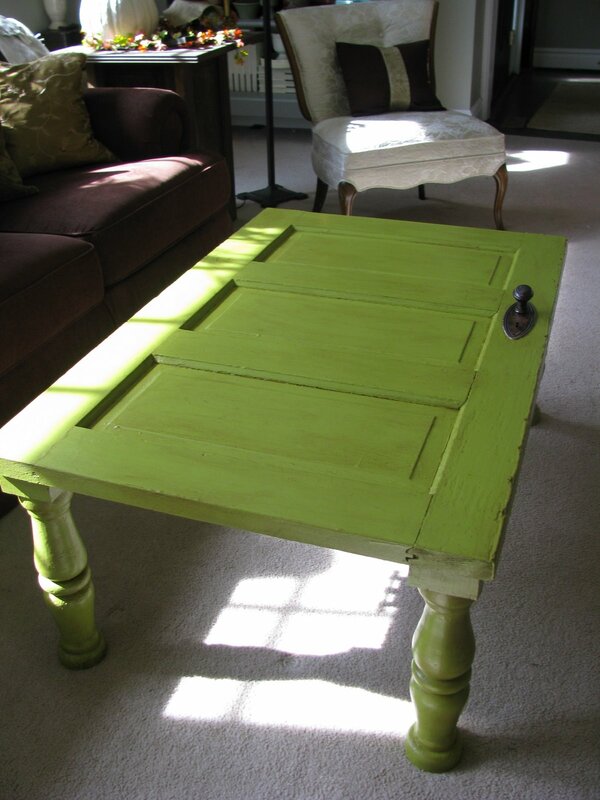 I especially love the door table. I have an old door that I am figuring out what to do with. 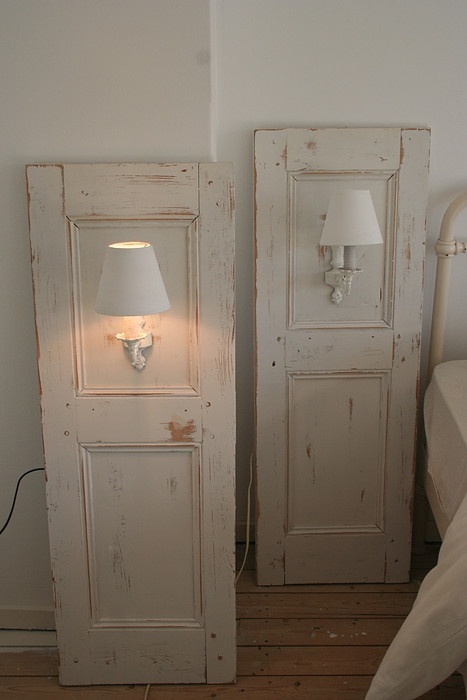 Love the picture in your post of doors as a headboard! 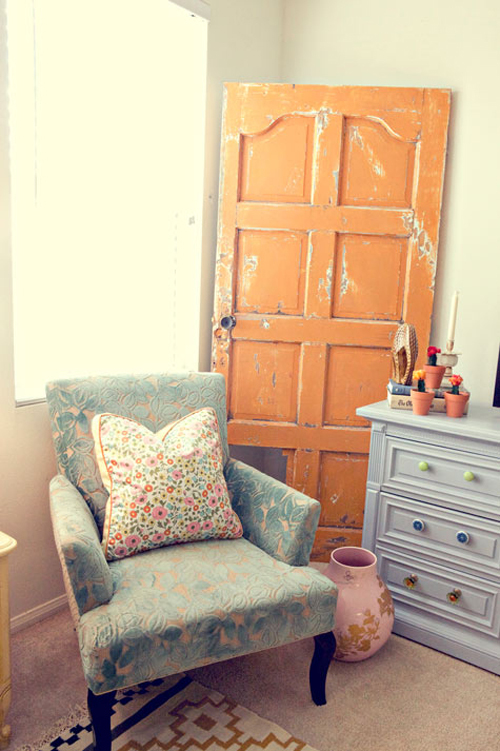 I love old doors! I've seen a few on the side of the road lately (people throw away the weirdest stuff), and I'm itching to take one home and make something. If only we had a garage or other place to work, I'd go to town! Grab them when you see them! 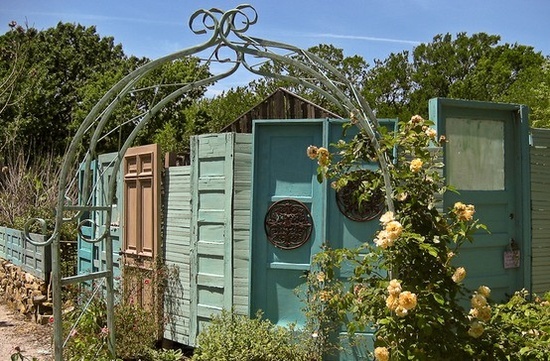 I especially love the shabby chic first door pictured. I love old doors. I am looking for a dainty-ish pair now to make into closet doors for a closet in my bedroom. 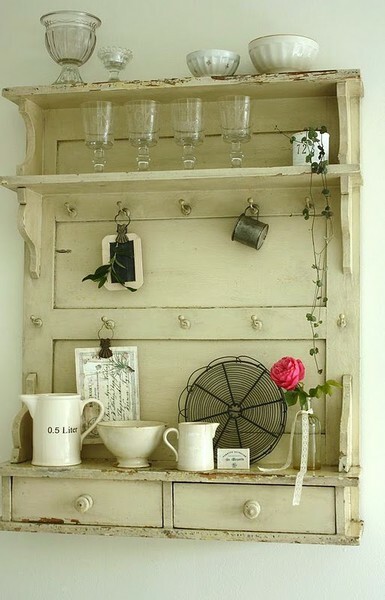 I love that chippy old paint too but I usually seal it as it is most likely lead based paint! 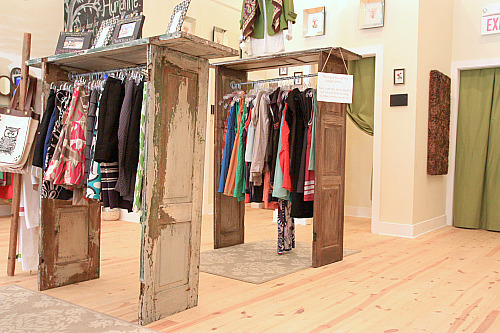 I used old doors a lot in my old store to make room dividers/screens to deliniate different areas. 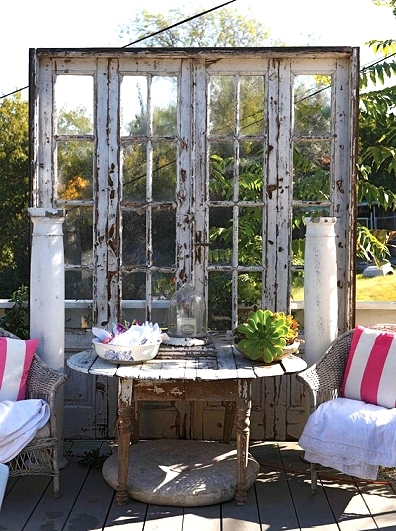 I love old screen doors especially. Is it dumb to wish I didn't have central air so I could leave my kitchen door with just the screen door closed during the summer? (I wonder how long it would take my family to yell if I shut off the air and opened the doors? LOL)I just love that old squeak and bang..just like Godsey's Store on The Waltons...and my gramma's house! Great post! 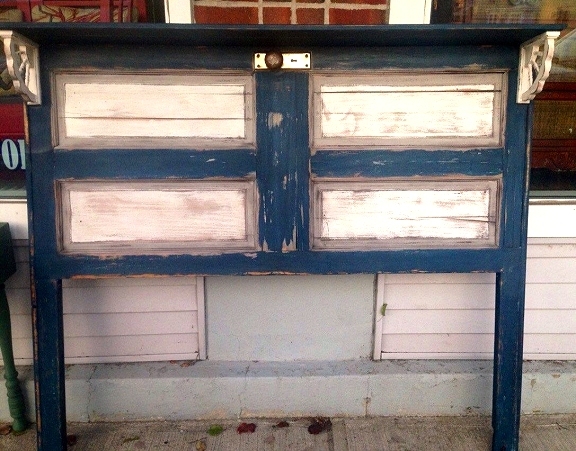 How do you seal in the chippy paint look from salvaged doors/shutters? 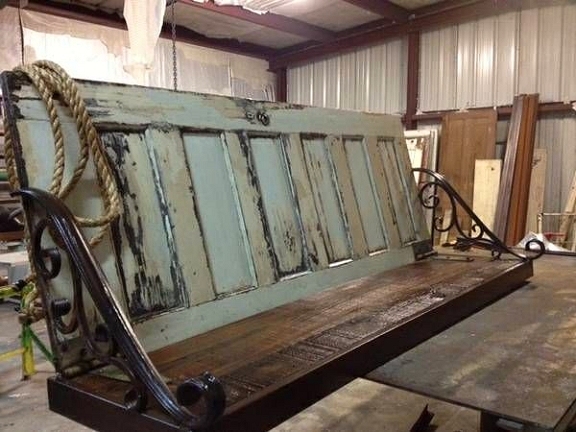 I have a set of vintage shutters with great pealing paint, and I need to seal them. 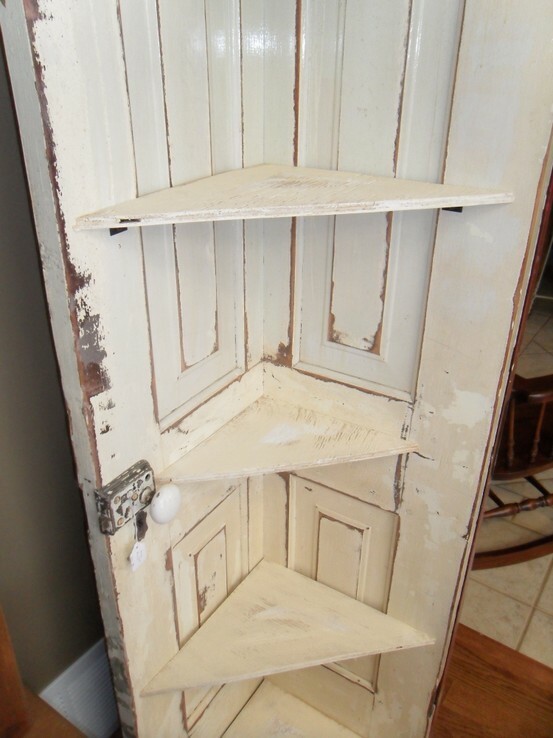 Seal those old doors and things with a poly top coat...allows you to keep the vintage "chippy" look without worry of lead dust! 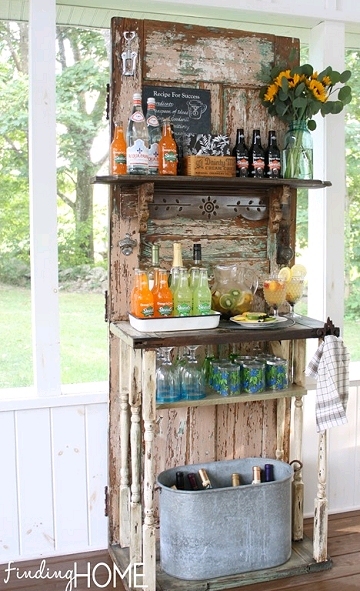 I use spray lacquer on old metal, old doors, old clock faces and everything else whose patina I want to save and seal. It comes in satin which has virtually no sheen. 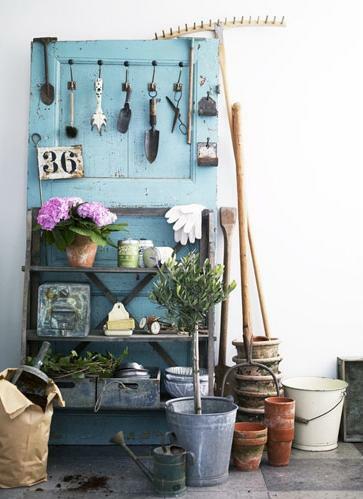 Love this collection of uses for old doors as I am a big fan, also. love these. 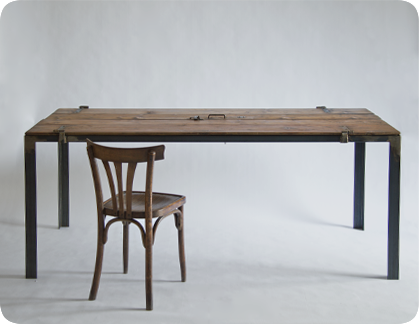 my dining room table is made out of an old door from mexico. 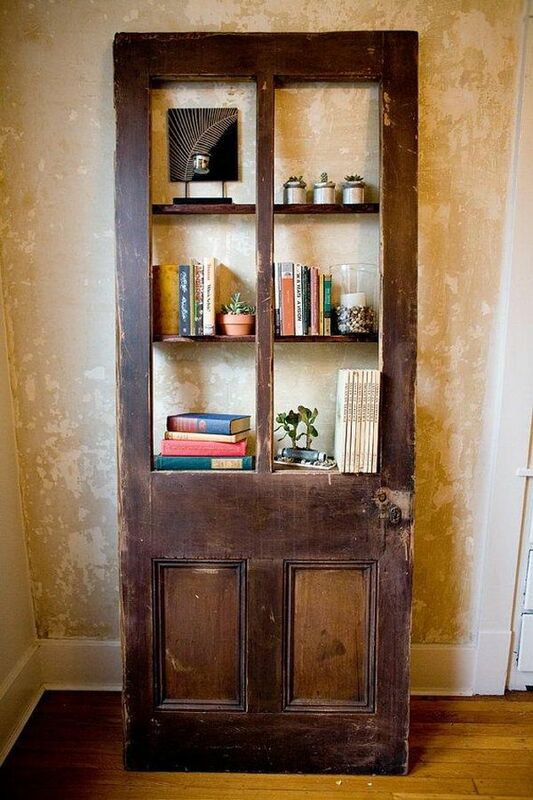 Thanks for featuring our door bookshelf in your post! 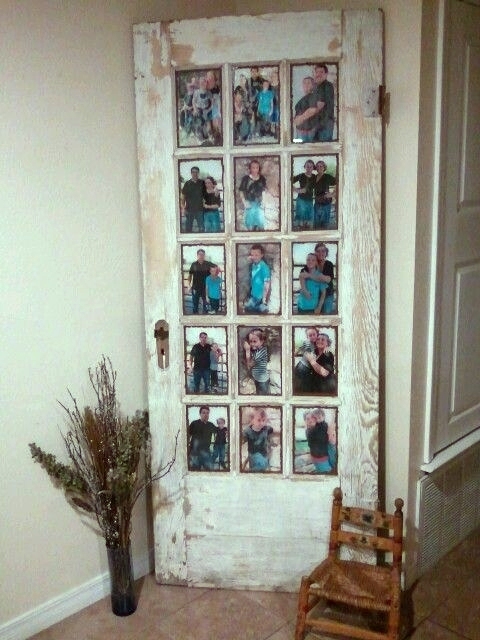 OUTSTANDING, I was lucky to be able to take alot of old doors out of a old family house that was being torn down. This give me alot of ideas to do with them. Thanks for all of the lovely pictures. Great! Hope you found some good ideas! Kraftylady in Ky I have a nephew that took 4 doors and made a closet for their washer & dryer in the bathroom. 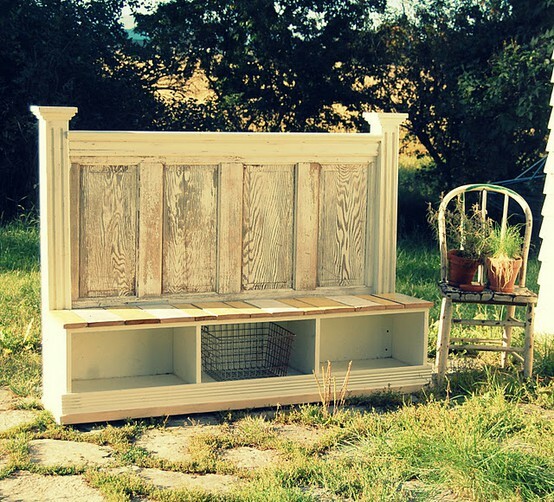 take doors and made several headboard for beds. One with Mirror (full lenght) One on the wall for his wife the place a wreath on. Great ideas for our Habitat for Humanity ReStore. Thanks. Gorgeous doors! I loved each and every photo. Thanks so much for sharing this. Seriously, I have no words. Let's start with creative, awesome and amazing blog! Love love love it. Looking forward to seeing more! (Ex-corporate with MBA turned artist). From one artist to another who appreciates beauty - nice to find you here! So glad you enjoyed the blog, thanks for stopping by! 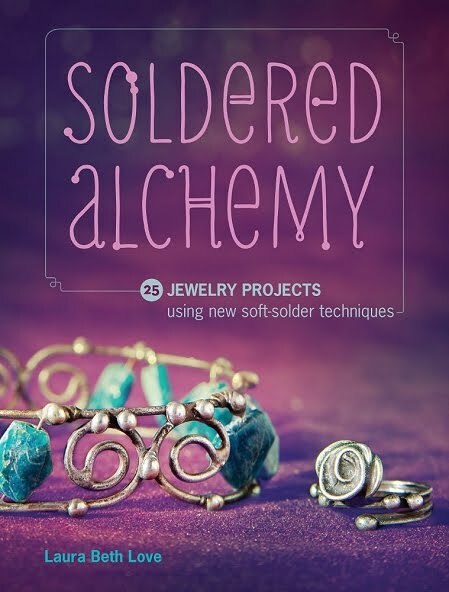 There are so many cool ideas here! 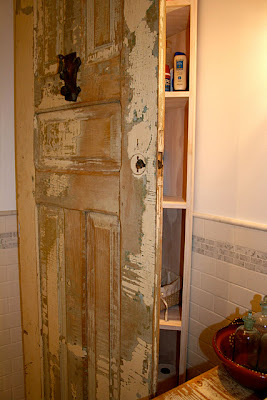 Does any one know where to get an old door from? 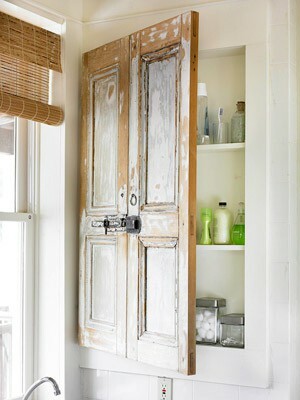 I want to do some these but haven't been able to find an aged door!. 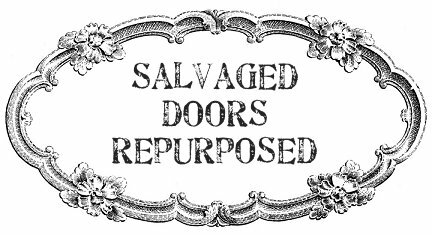 Try searching in your area for places that sell "architectural salvage." I love some of your uses of doors! Fantastic! I am totally in love with your blog. Thanks Amanda, glad you like it! Need help! 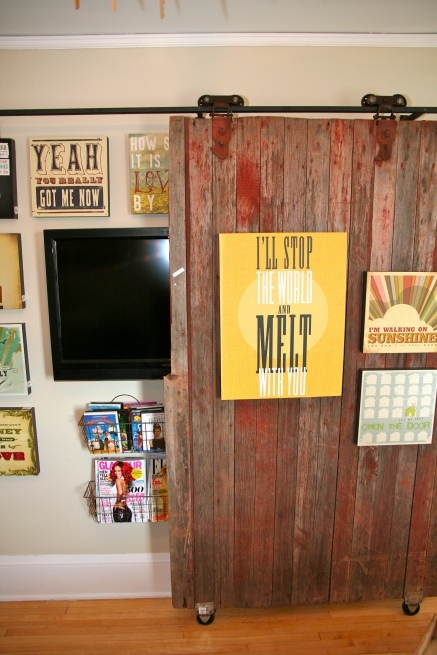 i have been wanting to create my own headboard using doors that I already have. 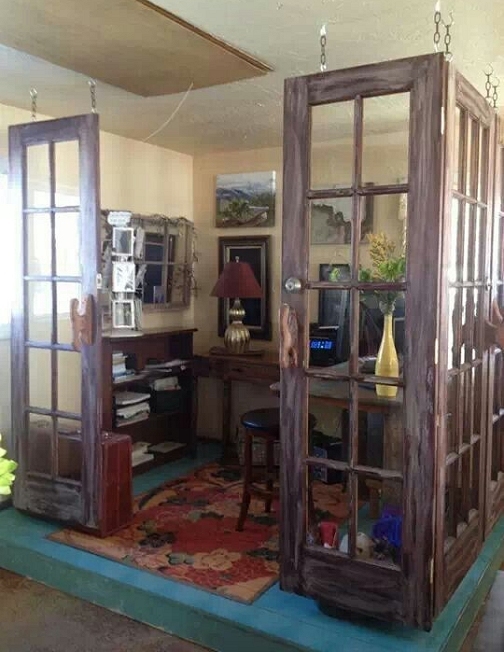 They are the doors that were for my closet and they are about half the size of a normal door, similar to the "antique doors on rollers". I know that I want to hang them verticaly (there are 4) however I am new at this, and dont know how I would go about decorating them, bonding them, etc... Any ideas??? 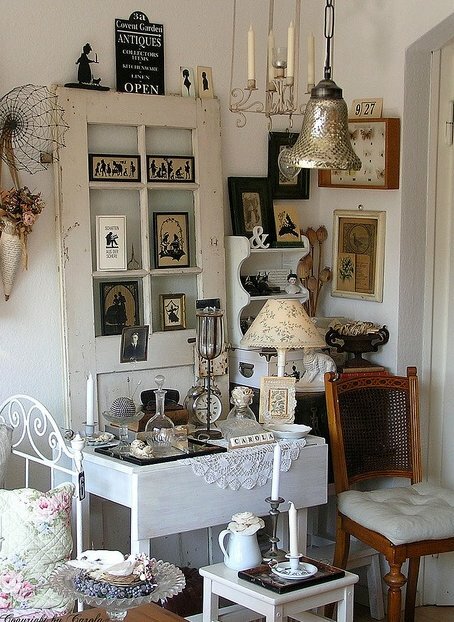 I want them to be some what modern, antique wont fit well with my current room. To get some ideas look through some decorating magazines or decorating websites. 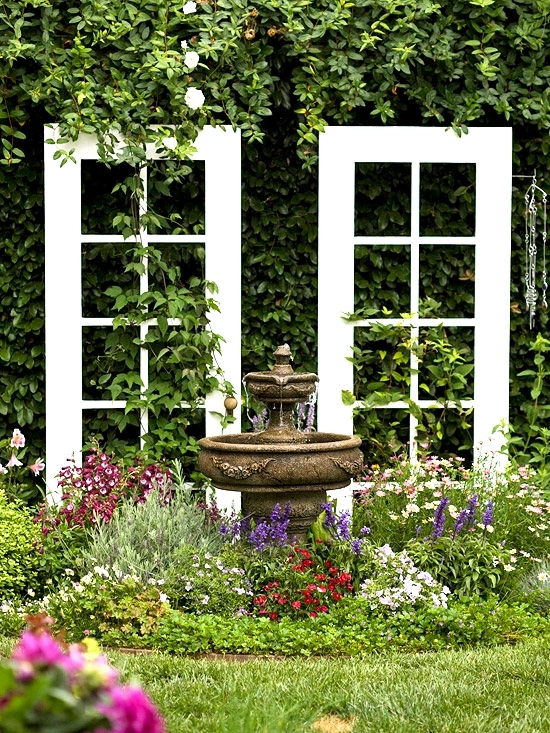 Houzz.com is a good place to start. 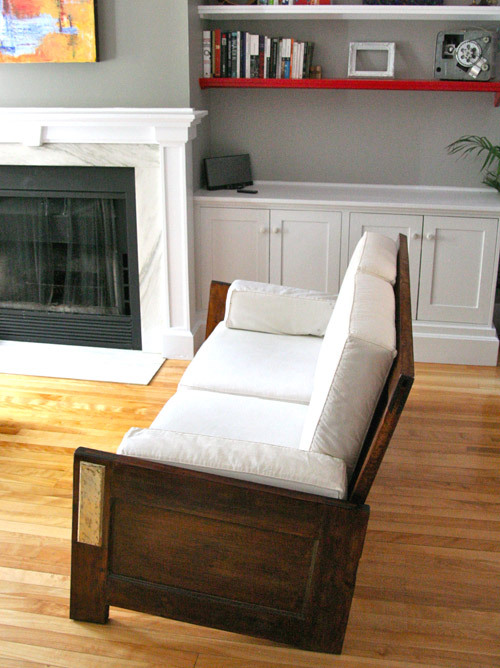 Once you know exactly how you'd like them to look - once you've chosen your paint colors, etc. then I would look into types of paint that would go with your surface (depending on what material your doors are made from) I have a good blog post a few weeks back about how to paint different surfaces. Don't forget to use primer if you are going to paint them. For the actual building, I would consult a friend who has carpentry skills (if you need assistance in that area), and also ask the folks who work at the hardware store. I am always asking them how I would go about doing this or that. They are always very helpful. The hardest part of this project for me would be deciding how I would like them to look and then getting started. Once you get started the rest of the project usually falls right into place! Just take it step by step and go for it! Good luck! 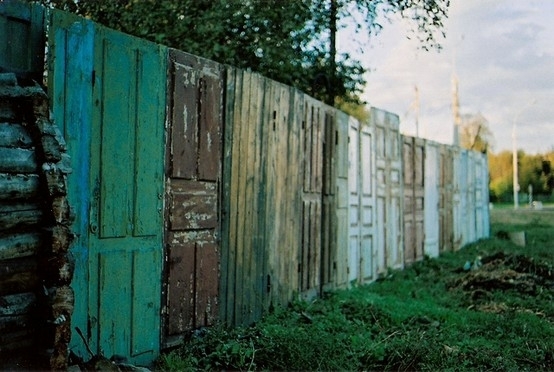 I love your form of art with old doors! They are truly wonderful and beautifully displayed! Keep up the good work!! I've pinned at least half these ideas! I got an idea a corner media center that I've been struggling with for a couple of years for a too-small, multi-purpose room! Use a windowed door upside down (windows on the bottom.) Mount flat screen TV on the solid portion with wires behind it (and no hunting for studs or making nasty holes in the wall! ), and electronics at the bottom behind the windows for remote access. Or use the door with the open design work at the bottom for air circulation to electronics. So glad I found this site before we replace our old windowed exterior doors! Glad to know you could use some of the info here. Thanks for visiting! i LOVE door frames! i just did my own little thing with a yellow one... http://tolosemyself.blogspot.com/2012/08/making-it-cozy.html so FUN! 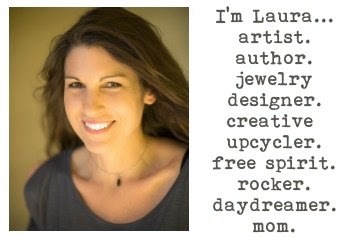 I just found your blog, and became your newest follower just as quickly! 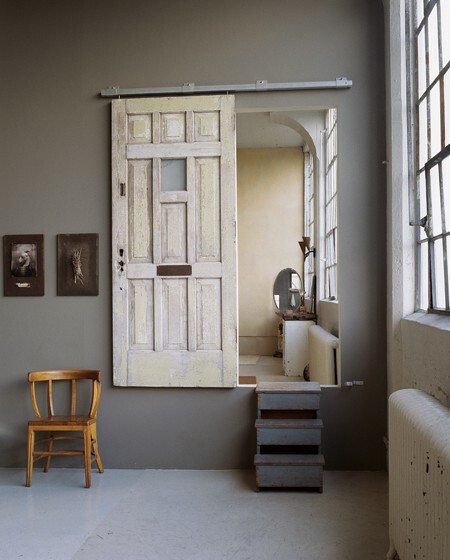 I love old doors, and these pictures have just given me another dozen ideas of things I want to do. 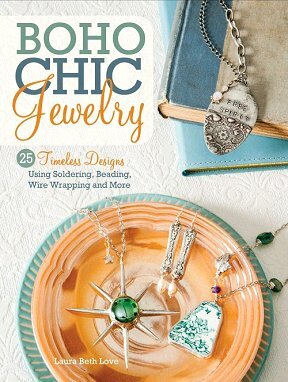 Gorgeous pieces, just gorgeous!!! Happy that you enjoyed it, thanks for visiting! Love your site & ideas! Wonderful! I have a door I've been saving for 20 years to do something with & you've inspired me! I loved them all!!! 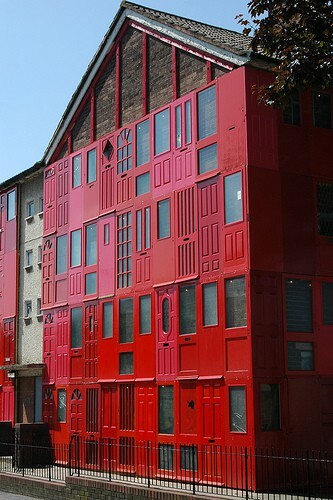 Very good ideas, I hope I lived somewhere I could put some of those recycled doors!! Thanks for sharing!. 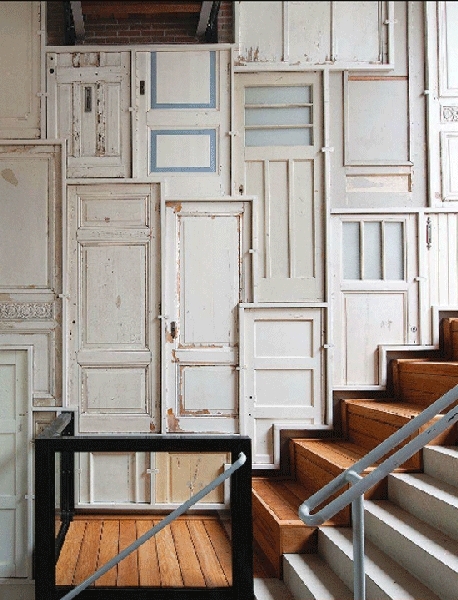 wonderful collection of doors, makes me want to go out and start acquiring them. Oh my gosh Amanda, I really don't know what to tell you. I guess you could always give it a shot and see how it works out for you, and if you're unhappy with the door you could switch it back to your old one. Good luck with your decision! go for it. If you already have a storm door that will help with the insulating factor. Just fill in all the cracks with wood putty, make sure the windows are sealed around the edges well and use the felt insulation strips around the outside. I'm so glad you enjoyed the post! Thanks for stopping by! 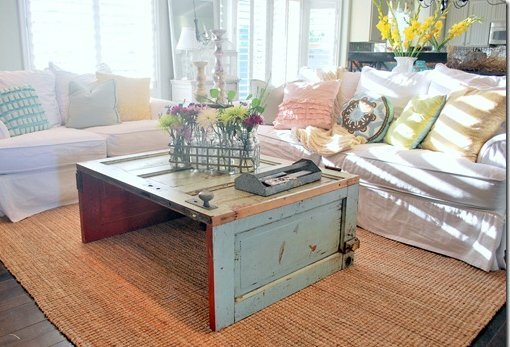 Great post...thanks for the link on Down to Earth Style. Found you on Pinterest. Glad you liked the post Holly! 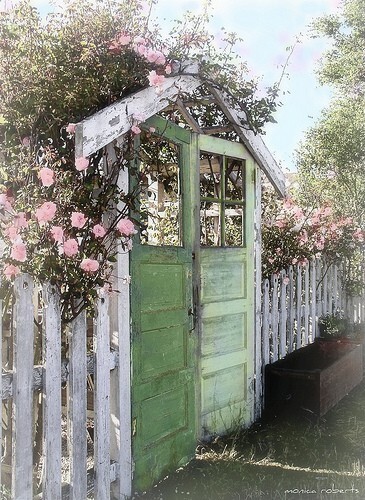 Or is it possible you could mount the door to the one in place, maybe even use some pine garland to hide the obvious edges of the door sticking out. You would have to be creative for the functionality of the door handle, I think you could pull it off. Just think, "outside the door!" Hope this helps! that's a good idea too! 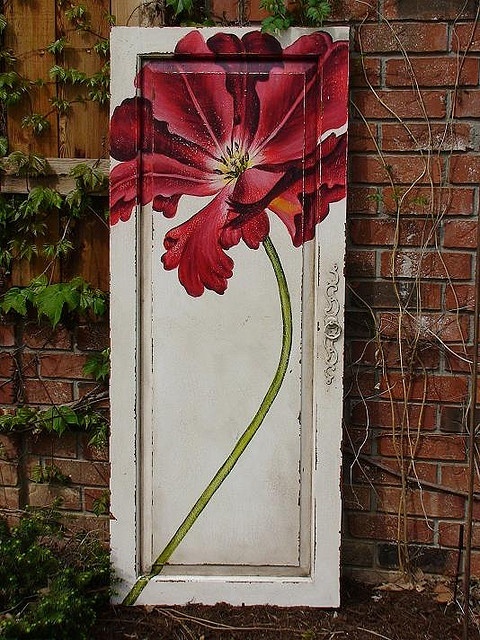 How do you do the wallpaper & decoupage door... its amazing I'd love to try it. I love that look! To mimic the look of the old wallpapered door what I would do is apply paper (and you probably could use any kind of paper - old maps, etc) let it dry completely then carefully peel/tear back sections to get the same effect as the door in the photo - then I would stain it all with a tea stain to give it that old kind of grimy look, let dry completely, then I would give the entire thing a coat of matte decoupage medium to seal it, just as you would with a small decoupage on wood project. It's just large scale. I'm just LOVING your blog! I found you a few months back when you featured my encyclopedia coasters and I've been coming back ever since! 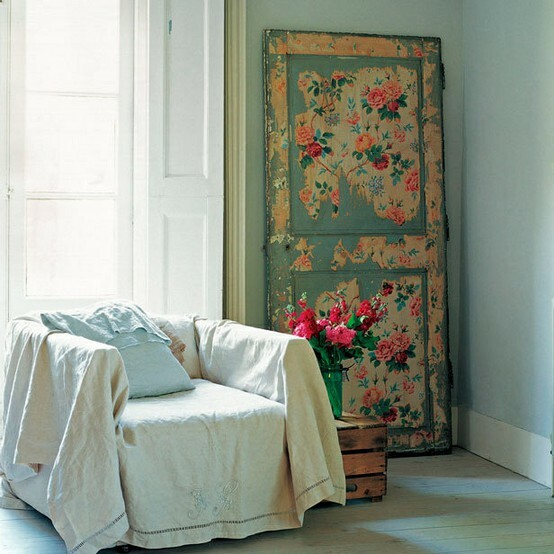 I've loved old doors for so long and you've got some lovely ideas here for using them. I just started repurposing vintage cabinet doors into art pieces using the same technique that I use for my coasters. LOVE using unique materials in unexpected ways. 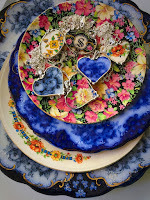 Thanks for your gorgeous blog! Keep up the great work! Love your blog! So beautiful and inspiring! 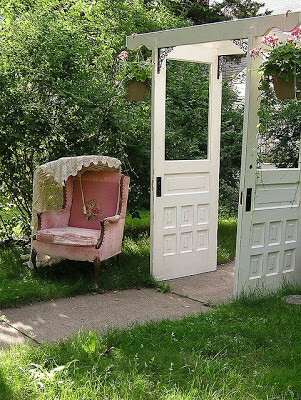 Truly inspired by the ORANGE door above (the one with the cactus) This is EXACTLY what I want to do with doors I just found on the side of the road. 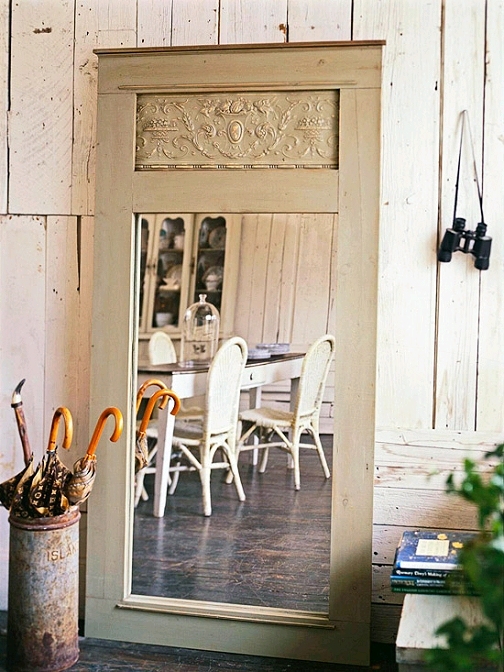 They have chipping white and green paint with a light brown finish and have two paneled glass running all the way down. How do I go about restoring them and painting them orange/ but lightly and vintage (as the photo shows)? Should I strip the white paint on them now OR will that damage the beautiful weathered look that they have naturally? Hi, I was thrilled to see my door pictured! Thank you for considering it worthy of your excellent blog. I found that door in the backyard of the Habitat For Humanity Restore in Corvallis, Oregon. Would you believe it cost me a whopping, $7.00? It wasn't marked so I asked one of the workers and he just rattled off a random, "Ah, how 'bout seven bucks?" I was trying to keep my cool with a nonchalant "Okay, I'll take it," while doing summer salts in my head! Major score. I'm not usually so lucky. :) Thanks for sharing. I have some old doors that I want to make shelves out of, but since they are old, I fear that the paint is lead base. Any advice on how to seal them or something so the lead based paint isn't a problem? Coolness! Yeah, umm my wife and I live in a parsonage and our church won't spring for a garage door for the carport. We live in the parking lot where the church building is. We need a semi-carport to function as a patio because we have almost zero backyard/zero privacy. Where do you buy the track and "track slider things" for the barn door up top? I have no idea where to buy that hardware that isn't astronomically priced?? Could you help a brother out? I really want to do something for my wife because this kind of project would make her so happy. Thanks!! Absolutely gorgeous!! The door from ticking and toil is to die for!! Such a beautiful post. Thank you for some truly inspirational ideas!! Such fabulous ideas, and SO MANY! Any suggestions on hwo to keep the old paint if it is lead? I'm thinking some sort of clear coat, but it will have to be sticky enough to adhear to the existing old paint. I absolutely love this. 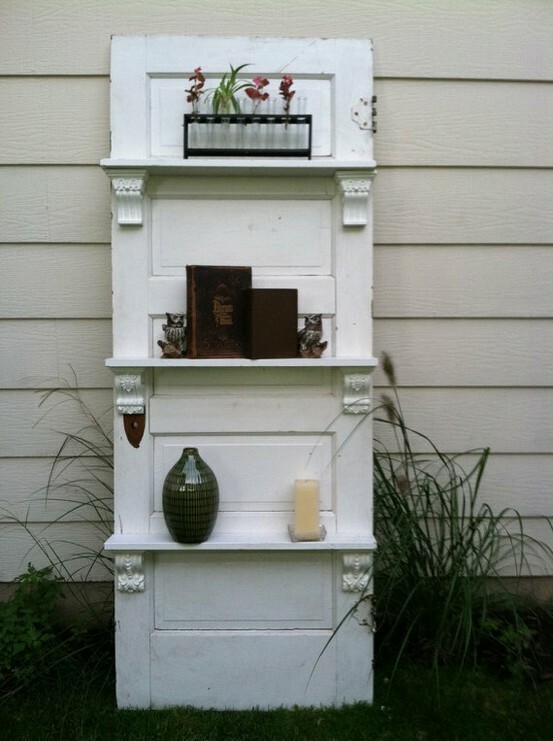 I am planning to make a cabinet using old doors and you have given me SO many ideas for the cabinet, but also for everything else. I can't wait to get started! Thank you! 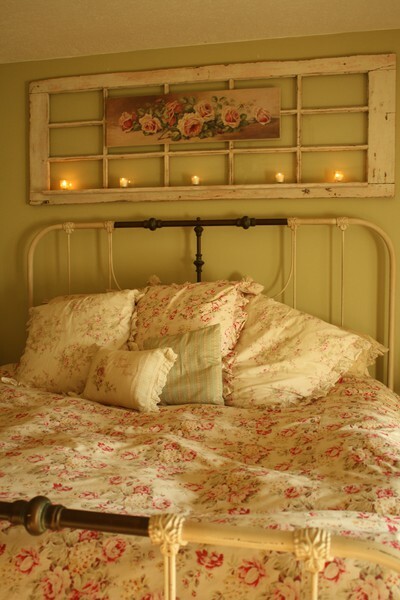 We made a headboard for our bed from an old door. 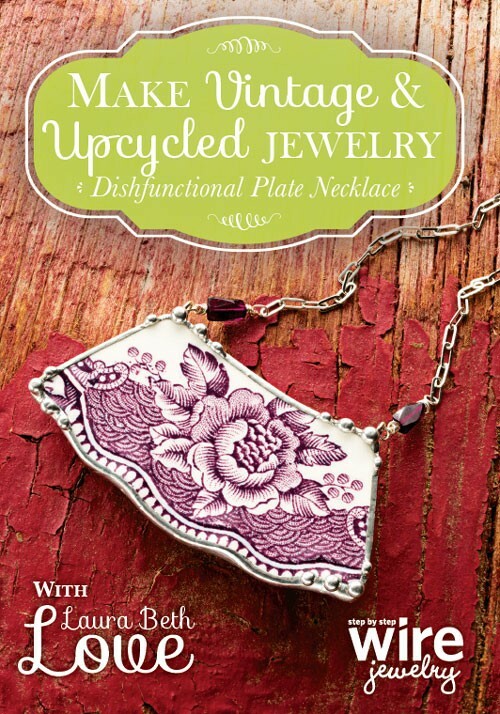 oh so wonderful..I wish I was creative and that I was a handy woman. Some absolutely splendid ideas! 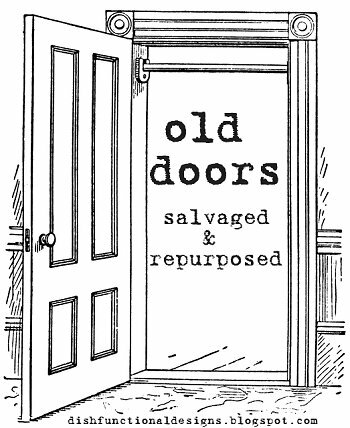 Now I have to go looking for old doors. I want 4 glass-paned ones to make a wind break on my deck. They can come down in the summer, but in the winter my poor animals get no shelter other than living in my garage. What a great way to break the weather! Glad you found the ideas to be useful. Keep those pets warm! Wow, what a fabulous ideas - thanks for sharing. You too, Kat. Thanks for visiting! 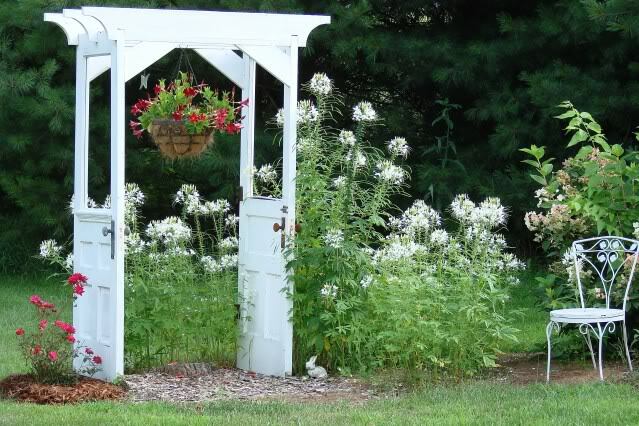 We have started collecting old doors for a fence made of doors. If you have ever make one I would love to have any tips or suggestions! I would love to see some photos of the finished project! Love your idea's. 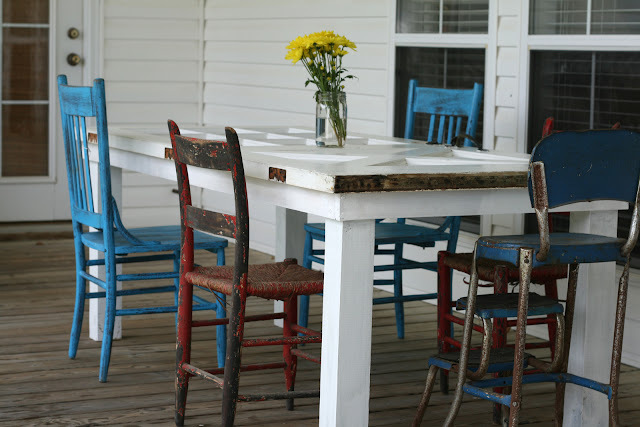 Have any on repurposing old wooden chairs? Yay! :) Thanks for stopping by! I'd like to know if you think it's feasible to hang 2 doors on a wall that I could take down and put on sawhorses when I want to use them as dining tables for family gatherings. I have a small living-room and dining rom combo and don't want the dining tables all the time, but am happy to move the living room furniture to one end of this long room in order to have the dining tables up. I'd like the doors to function as large art on the wall and then I'd like to take them down for these gatherings. How would you hang them? What could I use to make the wall pretty when they are removed? 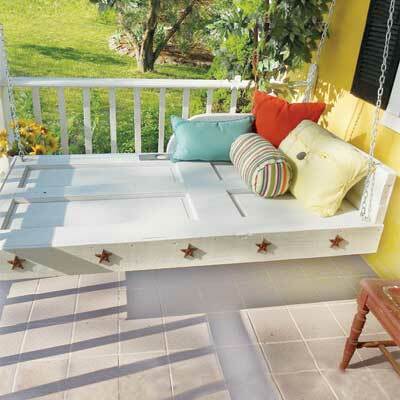 That's a great idea that is sure to be a space-saver. If I were to do that project, I would first make sure that the wall is strong enough to hold the doors, and that you use the proper hardware so that they are securely hung on your wall. To do this, I would get the opinion of someone at the hardware store who has experience hanging heavy objects, as I'm sure they would need to be anchored to the walls due to their weight. (meaning, I would not merely use a hammer and nails, but use anchors). Next, I would make the doors themselves into works of art, probably with a stencil and paint, and then of course with some type of topcoat sealant to protect the artwork. I would also be sure to do a lead test to make sure that the doors that you want to use as tables do not contain lead paint. You can buy lead paint test kits at hardware stores. As for how to decorate the wall behind the doors, you could use vinyl wall art or maybe even just have some alternate art that you can hang from the same hardware that the doors hang on that you put up when you take the doors down. Sounds like a fun project! Good luck! Lovely ideas! 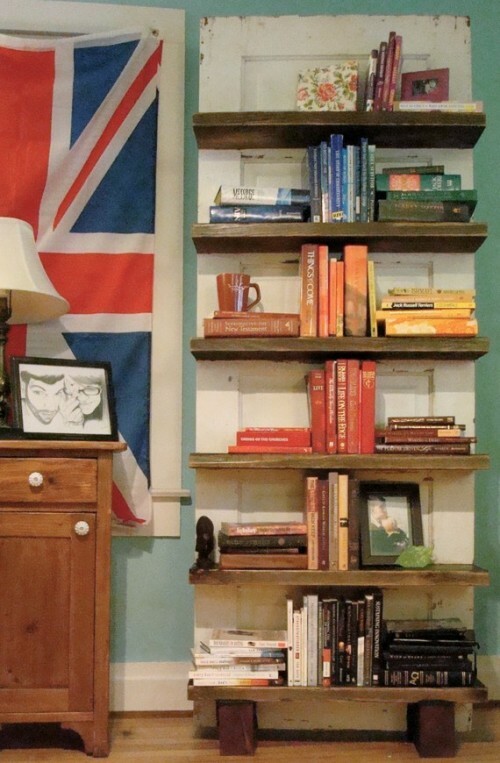 Especially love the book shelves. Thanks for posting. 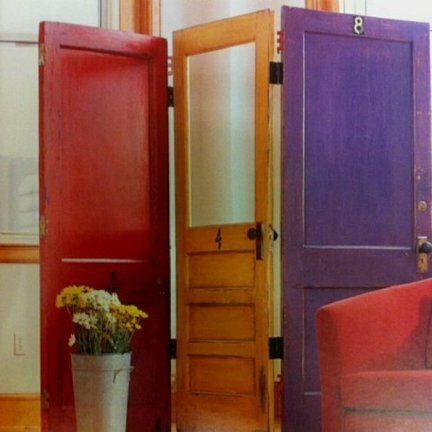 Brilliant idea, we can definitely reuse the old doors in our house in a more efficient way. Thanks for sharing this great idea. I have a door table, lady i got it from says it's an authentic spanish village door. However, it looks dirty and does not have a smooth finish. Should I sand it down and apply a finish? Or will it ruin the value and authenticity of the door? Hi, If you think something may be a valuable antique, always check with an expert before doing any cleaning or refinishing. 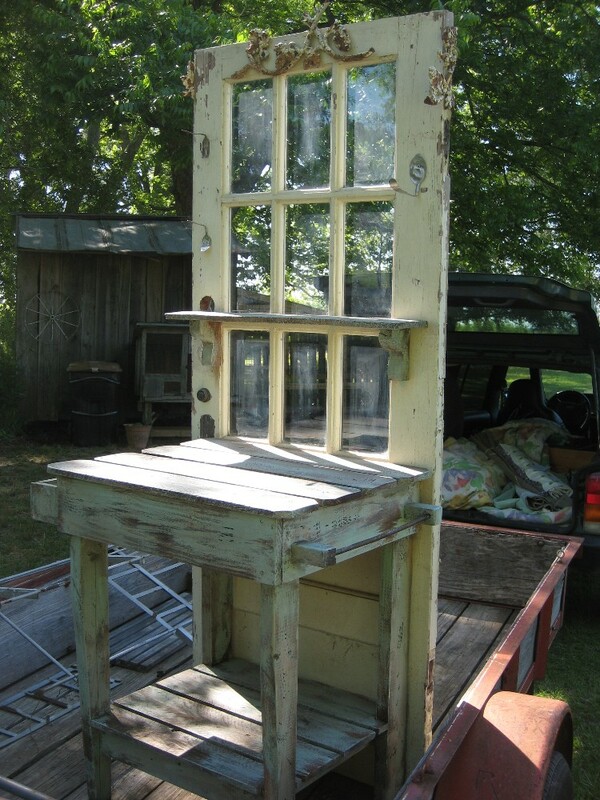 I would look for someone who specializes in antique furniture and ask their opinion. Good luck! 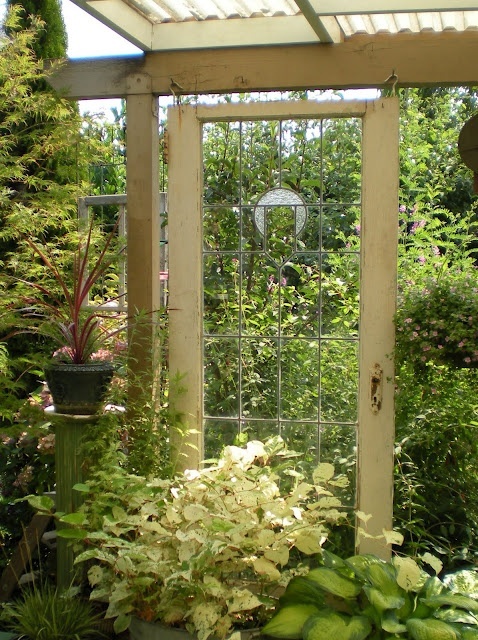 What would you do with a metal entry door or metal french doors with glass?